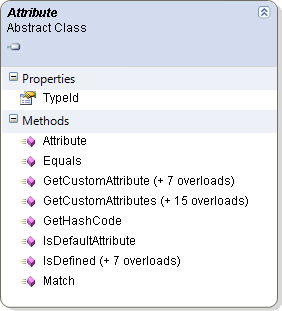 Short description: Represents the base class for custom attributes. The System.Attribute class is the "mother of all attributes". Besides being the base class for all the other built-in properties in the .NET framework and the ones you create yourself, this class also exposes a number of useful methods (like GetCustomAttributes) that can help you get a list of attributes that have been applied to other code elements like assemblies, members and so on.